The above graph shows the intensity of sound in decibels on the y-axis and the frequency of sound in Hertz on the x-axis. It compares the output from a hearing aid – with and without earmold. When a hearing aid is fitted via the software by the manufacturer, the output of a hearing aid is assumed to be meeting a certain target as calculated by the software and its algorithm. Thus a hearing aid dispenser might be satisfied that the setting looks good on the hearing aid programming software. But with a real ear measurement system like AXIOM (by AudioScan) we can see exactly how much sound is being provided by the settings of a hearing aid. The blue line shows the hearing levels of the patient while the purple line shows the output of a hearing aid without the earmold (as measured in a test box). 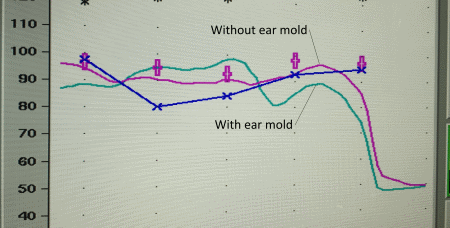 The green line shows the output of a hearing aid when an earmold is added. The purple crosses are the targets which would give the patient better clarity of speech. The high frequencies and low frequencies are lowered while the mid frequencies are boosted. This explains why the patient is complaining of sounds being unclear when s/he is using it. Therefore this hearing aid has to be refitted taking into consideration the acoustic modification of sounds caused by the earmold. Accurate hearing aid fitting can only be achieved with proper measurement tools. Consult your audiologist if you cannot hear speech clearly, they can measure the sounds coming out of your hearing aid, not just within a test box but also in your ear. This entry was posted in Hearing Aid News and tagged AXIOM, Real Ear Measurements by admin. Bookmark the permalink.